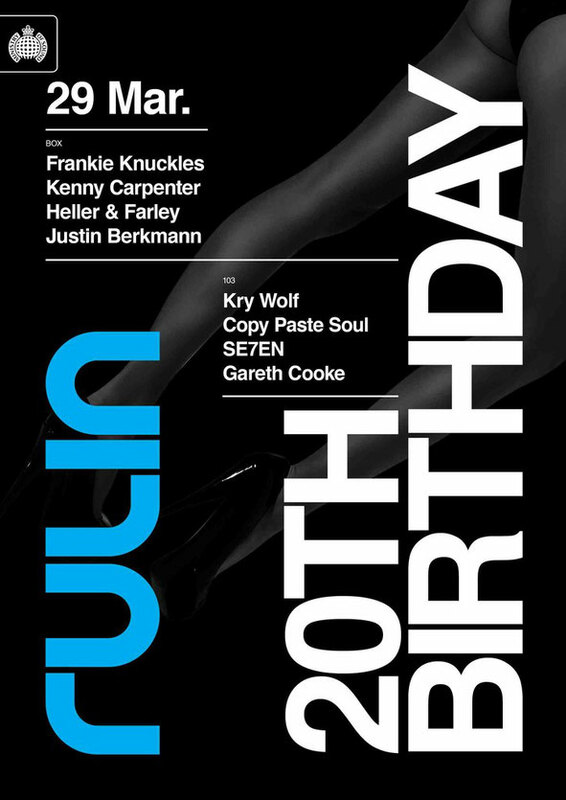 Rulin returns to celebrate its 20th birthday on Saturday 29 March at Ministry of Sound with a special appearance by the Godfather of House, Frankie Knuckles. The UK’s house night, Rulin was responsible for bringing over many of the US house and garage masters and helped transform dance music culture in the process, leaving an indelible mark on Britain’s clubbing landscape. Joining Frankie Knuckles in the Box are DJs who’ve each played a key part in Rulin’s success, including Kenny Carpenter, Heller & Farley and Ministry of Sound co-founder and original resident, Justin Berkmann. Frankie Knuckles, the Chicago Warehouse and Music Box DJ and original house music producer is responsible for classics including ‘Your Love’, ‘Baby Wants To Ride’, ‘The Whistle Song’ and ‘Tears’ plus a host of classic hit remixes such as Electribe 101’s ‘Talking With Myself’, Alison Limerick ‘Where Love Lives’ and Chaka Khan ‘Ain’t Nobody’. For over 30 years, the Grammy winning remixer has maintained the original ethos of the house music genre and educated successive generations. 103 will be putting a contemporary spin on proceedings with Kry Wolf, Copy Paste Soul,SE7EN and Gareth Cooke in attendance.